After a sold-out run at London’s off-West End venue the Menier Chocolate Factory, Trevor Nunn’s production of musical classic Fiddler on the Roof will dance into the Playhouse Theatre for a strictly limited run. Based on tales by Sholem Aleichem, the show concerns Tevye, a father of five daughters who tries to maintain Jewish religions and traditions as outside influences come into the family’s lives. Old traditions and young love collide as Tevye’s daughters’ unexpected choice of husbands open his heart to new possibilities. The show is directed by Trevor Nunn, who is best-known for directing the original productions of Les Miserables and Cats. Nunn has won numerous awards, including the Tony Award for the aforementioned shows as well as Nicholas Nickleby and several Olivier Awards. The choreography used in the show is the original choreography by Jerome Robbins. Robbins is known for his memorable choreography of other classic musicals, including West Side Story (for which he won a Tony Award) and Gypsy. Additional choreography is by Matt Cole. Fiddler on the Roof features classic songs including ‘Matchmaker, Matchmaker’, ‘Tradition’, and, of course, ‘If I Were a Rich Man’. The cast includes Andy Nyman and Judy Kuhn as Tevye and Golde. They are joined by Nicola Brown (Chava), Harriet Bunton (Hodel), Dermot Canavan (Lazar Wolf), Stewart Clarke (Perchik), Joshua Gannon (Motel), Matthew Hawksley (Fyedka), Louise Gold (Yente) and Molly Osborne (Tzeitel). The cast is completed with Miles Barrow, Sofia Bennett, Philip Bertioli, Lottie Casserley, Elena Cervesi, Lia Cohen, Talia Etherington, Shoshana Ezequiel, Isabella Foat, Fenton Gray, James Hameed, Adam Linstead, Adam Margilewski, Robert Maskell, Benny Maslov, Robyn McIntyre, Gaynor Miles, Ellie Mullane, Tania Newton, Craig Pinder, Valentina Theodoulou and Ed Wade. 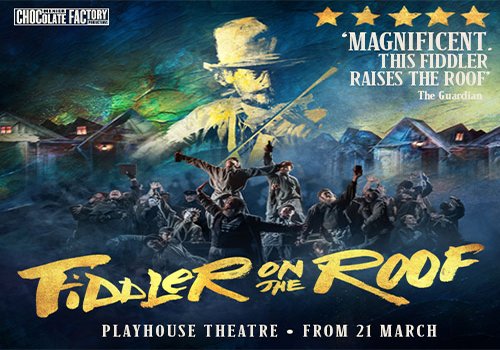 Fiddler on the Roof starts performances at the Playhouse Theatre from March 21st. Fiddler on the Roof is suitable for the whole family.